Last week’s Art Journal Adventure prompt was to create a mosaic or patchwork design. I have had it in the back of my mind that I need to be making more frequent and better use of my small gelli plate press and I thought this prompt would be a great opportunity to use it. I painted my art journal page black in the hopes that it would make subsequent layers of colour pop. I then used the small rectangular gelli plate to place oblongs of colour around the page, allow some to overlap. For the first layer, I used just whole blocks of colour. For the next layer of printing, however, I used stencils to create visual texture. Finally, I used ghost prints of leaf shaped masks hoping they would give the piece some focus, some place for the eyes to rest. Once all the printing was dry, I picked up some black and white paint pens and outlined the leaf shapes and some marks reminiscent of stitching in order to create more of a patchwork feel to the page. The outcome is not great but I enjoyed the process and will definitely try to pick up that small gelli plate for often to create layered backgrounds in mixed media pieces. This week’s Art Journal Adventure prompt was to use a hand on the page. Well pants! I used my hand shapes a few weeks ago in a different journal page. My challenge, therefore, was to come up with a quick, easy, simple idea that neither duplicated or echoed the page I had created before – or any other journal pages where I had used my hand as inspiration. Since the previous page had started with my hand shape and built up from there – using masses of colourful dots – I had the idea of doing the reverse and starting with the hand silhouette and peeling away a layer. Skeleton hand! I have a bit of a thing for (not anatomically correct) skeleton drawings at the moment so I was enthused by the idea. I had to create a background for my page. Wanting a bit of a macabre feel for the skeleton hand, I opted for a red and green colour scheme, connotations of flesh, blood, putrefaction, and decay. Having so recently had such a sucky result from using my gelli plate, I decided to give it another whirl and see if I could get a better result. This time I used my miniature gelli-plate in the hopes it would provide me with a bit more control over the placement, slow me down a bit, and make me think. I used it to build up a patchwork of red and green rectangles. The red and green looked a bit bogging together but that was, after all, part of the point and the feel I was aiming for. When it came to the hand, I drew around my own hand and filled it in with black acrylic paint. I used Dylusions paint as I find that black gives a really rich black, smooth, velvety finish which is ideal for drawing on top of. Once that was dry, it was just a case of using a white paint pen to draw in the bones. 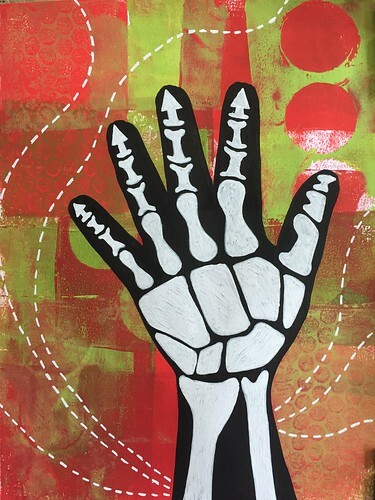 I had a quick glance at a photo of a skeletal hand but clearly did not make my drawing anatomically correct. I mentioned how rusty my art skills were when posting about Pink Girl. Well, a little bit of drawing and watercolour was not enough to bring my skills back to their former standard. It seems that two weeks of no drawing might necessitate at least two weeks of art practice to restore me to my former ability. I write this by way of introduction to my first Let’s Face It artwork since our road trip because the outcome was hideous. 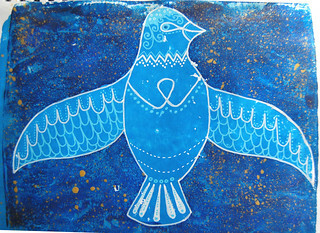 The lesson was taken by Lucy Brydon and incorporated gelli printing on tissue and painting on top of a tissue background. The current theme being to paint faces and hands, it was necessary to build a hand into the composition. I went wrong in so very many ways. The skin tone is ghastly, almost cadaverous, because I did a terrible job with the underpainting and layering. I tried warming it up by plonking more media on top of the acrylic but that just made her less corpse-like and more deathly ill. I also totally screwed up the proportional relationship between the hand and face. The detail of my gelli prints was entirely lost to the extent that I may as well have skipped that stage of creation, though I do quite like the texture of the background. 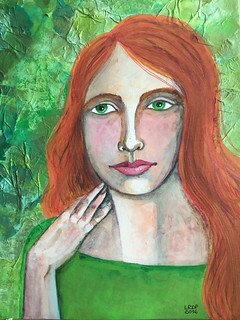 I like the red hair against the green (though the hair lacks interest and texture) but I think I did a better job with this colour palette way back in the second lesson. In short, this painting is a hot mess. Even my kids, normally my best and most committed cheerleaders, looked at this painting and screwed up their noses and struggled for something positive to say. It was frustrating as I spent more time on this painting than I really had free and it all feels a bit like time wasted but I need to remember that even my most rubbish paintings, even my mistakes, are learning opportunities. In order to catch up with the Documented Life Project challenges, I decided to combine two together. The challenges involved using a hand carved stamp and using masks. 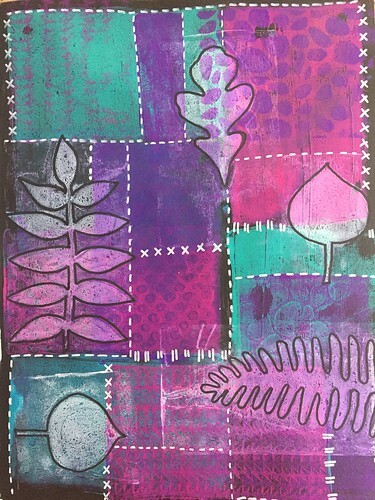 I used the gelli plate to construct a background in my journal page. I cut some chunky, wiggly lines from cardboard and used those as masks on the gelli plate to print on to a page collaged with text pages. By moving them around on the gelli plate with each change of colour, I achieved some nice layering. That gave me some water. Next I needed the fish. 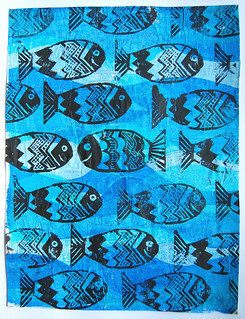 I had some scraps of lino so I used those to carve two fish stamps. 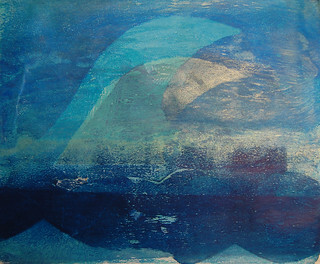 Using block printing ink and a baren, I printed one fish – different from the rest – swimming in a different direction from the rest of the shoal. I was thinking about the need for each person to find their own way in life, the importance of not just following the herd (or shoal) but making informed and active decisions instead, of celebrating non-conformity, of how life is richer because of diversity and difference. Maybe I should have added a quotation to make the message explicit but I like to think the image, for all its simplicity, conveys the ideas well enough. We moved on from Chagall’s symbolic dreamscapes to Magritte’s surrealism. We started off by looking at a few of his paintings and having a chat about them, sharing ideas as to possible interpretations. We looked at “The Treachery of Images” and discussed the idea that the representational nature of art (the pipe is not a pipe but a painting of a pipe) immediately detaches the art work from reality. The other painting we discussed at length was “The Son of Man” and had lots of ideas about why their is an apple in front of the face: gravity and scientific discovery, original sin, spherical shape like the globe, and an apple being the artist’s favourite fruit. We also observed recurring themes in Magritte’s work: obscured faces, cloudy skies, birds, and bowler hats. The it was time to start creating works inspired by Magritte’s art. As I suspected would be the case, the boys all chose to work on drawings inspired by “The Son of Man”. 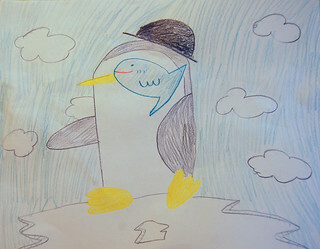 My 12 year old continued with his penguin series and gave his penguin a bowler hat and a face partly obscured by a fish. 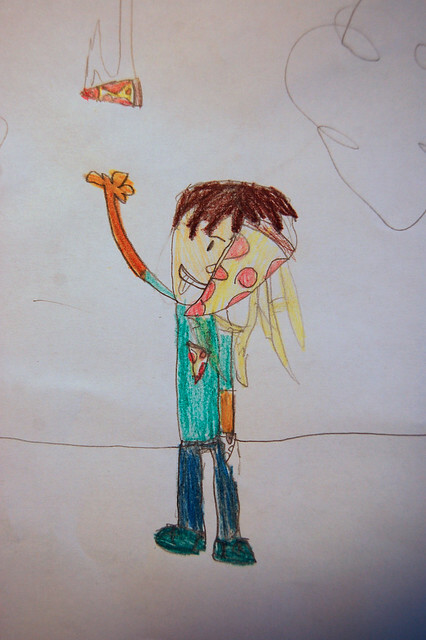 My 8 year old drew a self-portrait with the face obscured by a slice of pizza, his favourite food. 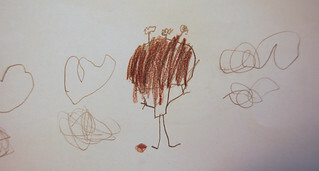 My 6 year old drew a tiny drawing of a figure with his face covered in chocolate cake. My 10 year old drew his favourite food – my homemade chicken curry – descending from a cloudy sky but he’s not happy with his drawing so I agreed not to share it on the blog. Since I already did a version of “The Son of Man” for my Magritte inspired Bunny, I decided to take my inspiration from another painting, “Sky Bird”. I decided to play around with masks on my gelli plate again, as I had done with Hokusai’s Wave, with a bird shape in a day time sky and the negative space as a night sky. I then embellished the bird using paint pen. When it came time to study Matisse for our History of Art summer project, I decided we would concentrate on the latter part of his career when he turned his attention to assembling paper collages from cut paper. 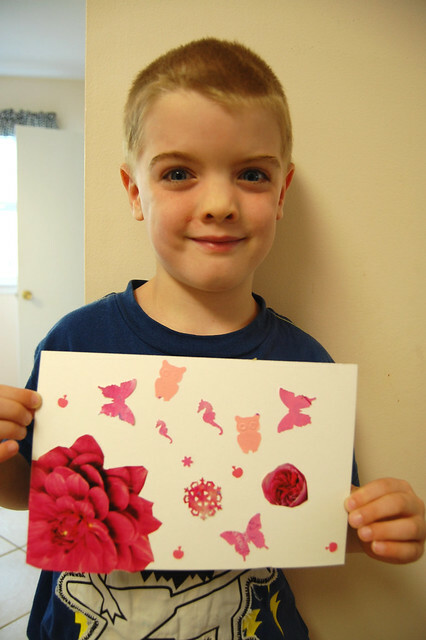 This would enable the kids to explore collage and decoupage as an art medium. 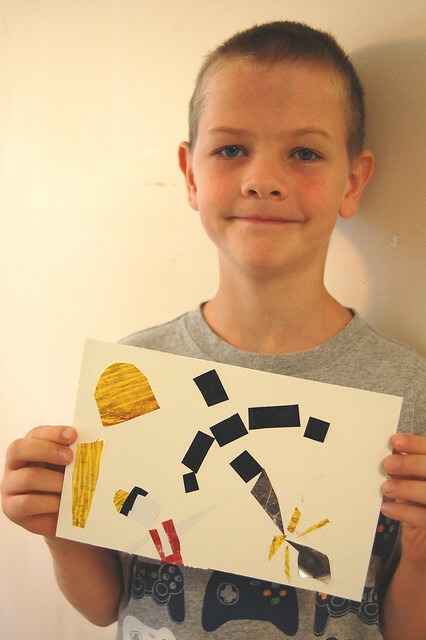 We looked at several examples of Matisse’s cut-outs and explored his use of organic and geometric shapes and his use of colour. Without telling them the title, I asked the boys to interpret the piece named ‘Icarus’. Their ideas ranged from it looking like a figure dancing among flashing lights, a figure surrounded by fireworks with their heart pulsing, to a figure being shot with the jagged yellow shapes being gunfire and the red circle being a wound. I have all my collage papers arranged in files by colour (because I am a control freak but it does make sense, I am sure you will agree) which helped reduce the faffing around when it came time for the boys to create collages. They had completely free rein with regards to subject matter so it was interesting seeing what they came up with. I had anticipated than my oldest son might cut up lots of squares from different papers and then form them into a blocky Minecraft figure but I was wrong: he went with penguin for this one. He used a mixture of magazine pages and gelli prints and hand cut all the shapes with the exception of the snowflakes which were punched out. 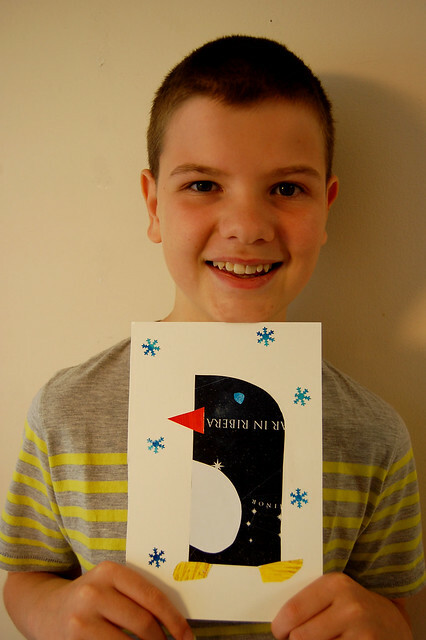 By stroke of luck, the white words of text cut across the black form of the penguin’s body at neck level, to separate the head from the torso, and there is a constellation of stars that form the hint of a wing shape. That was a good lesson in the coincidences and happy accidents of creating art. My 6 year old decided to work in a monochrome palette and selected pink. He used a mixture of gelli prints and magazine pages. He started out cutting out shapes by hand but then he got into my stash of shape punches and he was hooked. 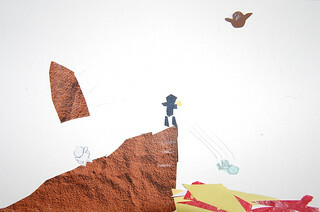 My 9 year old used scraps from gelli plate prints to construct a scene from ‘Aladdin’. As Aladdin, with dark hair and fez hat, looks on, the genie has emerged from the lamp. The yellow shapes to the left are treasures in the cave of wonders. I think he did a good job manipulating geometric shapes into recognisable forms but I am mostly chuffed that he actually conformed to the parameters of the lesson. Sticking with movie inspiration, my 8 year old created a tiny version of a scene from an epic movie. It’s Frodo and Sam reaching Mount Doom and Gollum falling into the lava. In his version, however, Frodo has kept the ring. That is an eagle flying in overhead ready to save the day – better late than never. My effort was done in a bit of a rush. I used a black background of acrylic paint to foreground the paper elements. 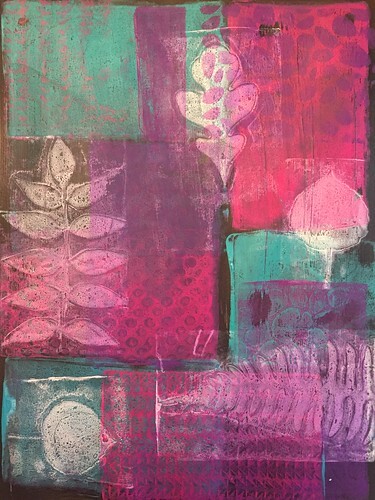 All the pieces are cut from gelli plate prints. I hand cut the figure and am quite pleased with the curves of the abstracted shape. I resorted, however, to using shape punches for the birds and butterflies. 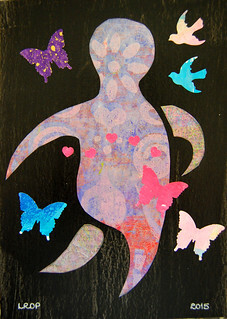 You can see my Crazy Critter inspired by Matisse’s ‘Icarus’ here. Hokusai was the next artist we studied in our History of Art summer project. We looked at his woodblock prints, especially his series The Thirty-Six Views of Mount Fuji. The boys and I all loved a number of the prints but were all drawn to The Great Wave off Kanagawa and declared it to be our favourite. We then discussed why that particular print is not only Hokusai’s most celebrated work but also why it has become so iconic. We personally liked the fact that the print is almost monochrome and that the curving shapes of the waves lead the eye through the image while also framing Mount Fuji. I also like the fact that the wave dominates the image while the tiny figures, clinging to their boats, are almost lost in the composition, suggesting the power of nature versus the powerlessness of humanity. Unsurprisingly, we all chose to create version of the Great Wave in the creative part of the lesson. You will have noted that it is either Minecraft or penguins with my oldest son so I was not in the least bit surprised when he decided to depict penguins in his drawing. The penguins are surfing and the sun has become some sort of monster. 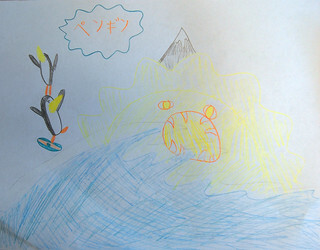 He did manage to include Mount Fuji in his drawing. He had noted Hokusai’s calligraphy in a box within the print so he researched how to write “penguin” in Japanese characters and added that to his drawing. At least, he tells me it says “penguin”. 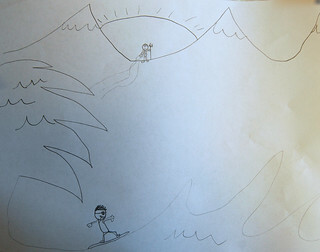 My 8 year old also went with the surfing idea. 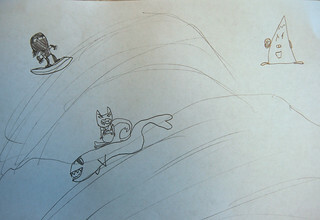 I think the figures are either superheroes or ninjas but one is riding a surfboard and one is riding a sea serpent. I like the fact he has turned Mount Fuji into a character. My 9 year old went a bit mythological with his drawing. He depicted Neptune commanding the waves so that a figure in the foreground can surf. My 6 year old and I decided to do something a bit different and got out the gelli plate so we could produce some prints. We used paper to create our own wave shaped masks and stencils with mixed results: they worked very effectively at first but soon ripped when they became soggy with paint. My 6 year old achieved some really lovely textures with his print and some pleasing sweeping curves with his wave shapes. My youngest son’s gelli plate print was actually far more effective than mine. My composition was not as effective and, while I had some areas of lovely texture, there was not enough definition between areas of colour. I decided, therefore, to embellish my print. Oddly this is not something I had done with gelli prints before. 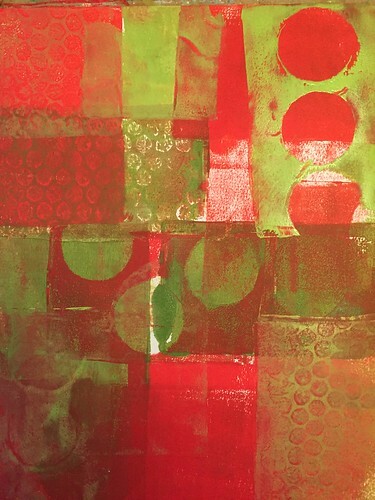 I normally use the gelli plate to produce papers for collaging with rather than to produce compositions. 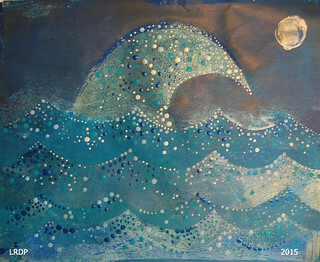 I used various shades of blue and white acrylic paint to make the wave shapes more distinctive. I love using dots in my art work so I used different sizes of dots to create a visual echo of surf and white horses capping the waves. 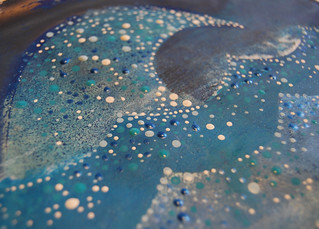 I used a metallic blue paint for the dots which, along with a pearlescent blue used in the gelli print, created a nice shimmer to the finished piece. If you would like to see my Great Wave inspired Crazy Bunny over on my art blog, please click here.